You know what I'll be doing a lot of for the next 2 months? Sewing. And sleeping. The only logical way to combine the two is to dream about sewing, right? Or make pillow cases! 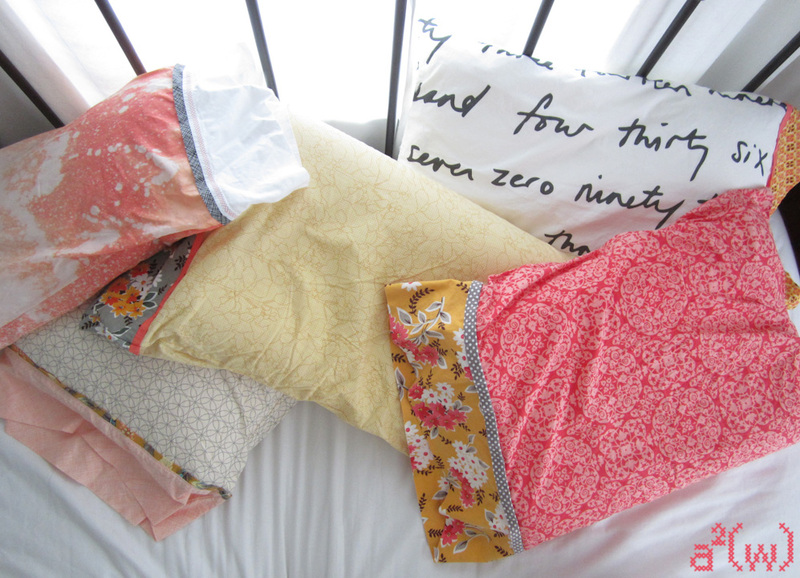 As you may recall, I posted a tutorial just about a year ago for enclosed pillow cases. They prevented my hubby's pillows from (magically) coming out of their cases overnight. But because I must constantly be making I decided to try another version of pillowcases with an inner pocket. Years ago I bought some pillowcases from PBKids that had a flap on the inside to keep the pillow in. Genius! Combining that with the best pillowcase method ever - the hot dog - I have lots of cute pillows for my bed. To make this, instead of 1 big piece for the body, you'll use a front piece and back piece. And I prefer a thinner decorative band. My favorite pillowcase is the one that is bleached (intentionally!) with the white edge. I had a lot of fun playing with a spray bottle full of bleach. And you'll see that along the edge instead of a straight top stitch I used one of my decorative stitches. I opted for the Pinnable tutorial, so here it is in one long photo. I'm sorry, Flickr turned this photo neon when it uploaded! Where is the finished photo of this pillowcase? Well, the room it goes in is still under construction...There should be pictures next week though! What a fabulous idea! I'm going to make one tomorrow! I have a pillowcase similar to this that I purchased, and I thought "what a great idea!" And now I know how to make them myself, thanks to your great tutorial! Thank you! Thank you! I've made the pillowcase without the pocket before, but I'll be adding a pocket to the next one!